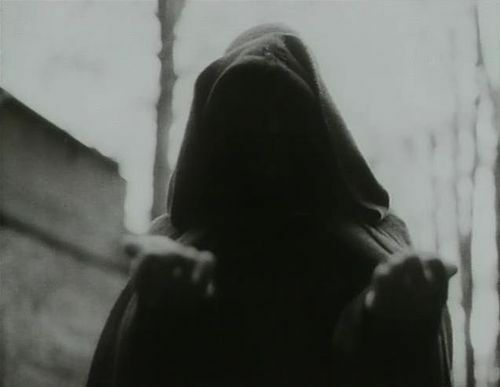 William Fryer Harvey (1885-1937) is best known as an author of Golden Age supernatural horror fiction, though in fact he is somewhat difficult to classify as a fiction writer. To be sure, his most highly regarded short story, the unforgettably macabre "August Heat," is a classic of the supernatural (and his story "The Beast with Five Fingers," about a severed hand with a will of its own, was made into a Peter Lorre shocker film with the same title). But some of what Harvey wrote is more accurately classified as crime fiction and some as neither crime nor horror, exactly. A fine collection of Harvey short stories, The Arm of Mrs. Egan, published posthumously in 1952, illustrates the difficulty in classifying Harvey's tales. Twelve of the sixteen stories (probably all written in the 1930s) are narrated by a middle-aged English nurse named Wilkie, a tough-minded but good-hearted person rather reminiscent of Mignon Eberhart's Sarah Keate--though Nurse Wilkie doesn't share Nurse Keate's propensity for wandering along dark corridors and eavesdropping at doorways (there also are four additional, rather incidental, stories). The Nurse Wilkie tales are subtitled "twelve strange cases," which is fair enough. Fully half of them are unambiguously crime tales, however. One of these ("The Lake") is a true tale of detection, one of the finest I have ever read (in A Catalogue of Crime, Jacques Barzun and Wendell Hertig Taylor justly label it "superb"), masterfully told and cleverly clued (with Christiesque precision). There is also an undertone of eeriness in the story that is characteristic of Harvey. 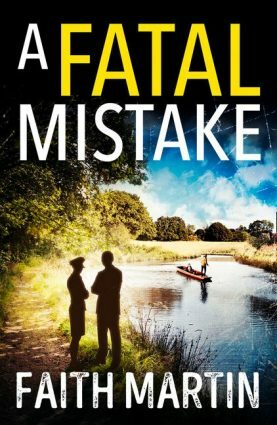 It's a hackneyed situation--the murder of a rich old lady at a country house by, presumably, one of her dependents--but in Harvey's skilled hands it seems completely fresh. Every classic crime fiction fan should read this one. In this volume there are a number of other tales in this vein: "Euphemia Witchmaid"; "Ripe for Development"; "The Vicar's Web"; "Old Masters"; and "No Body." While none has the structural depth of "The Lake" each is a good tale, with a twist. Cardew summed up her impression of the place by saying that everybody seemed to be shut in. They all lived their own lives behind hedges which they watched every day to see if they were growing taller, and didn't seem to care to know who their neighbours were, nor what happened to them. New houses were being built; houses that last year or the year before were new, had notices up that they were for sale. You came and you went. 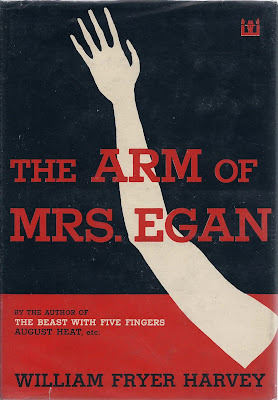 Three of the tales in The Arm of Mrs. Egan, including the superb title story, are supernatural--or at least might seem to be so. In their splendidly unsettling ambiguity I was rather reminded of Henry James's The Turn of the Screw. Like James (Henry and M. R.), William Fryer Harvey knew that the truest literary horror is best left understated. The remaining three stories are rather harder to classify. One, "Atmospherics," is a psychological study of unexpected malevolence, another, "Chemist and Druggist," a moving sentimental tale with a twist in the manner of O. Henry. The last of these three, "Dark Horses," seemed to me the only fizzle in the lot. Harvey does a fine job of capturing Nurse Wilkie's narrative voice (I would have loved for her to have another volume of adventures). He also is superb at portraying elderly women, beneficent or otherwise. Read "The Flying out of Mrs. Barnard Hollis" some All Hallows' Eve if you get the chance. You surely won't be disappointed. Fortunately these stories are included in Wordsworth's recent generous (and cheap!) edition of William Fryer Harvey tales, The Beast with Five Fingers (2009). You can also still find some copies of The Arm of Mrs. Egan for $35-$50. It's a great book. Never heard of this author before. But he seems very interesting. Hope I find some of his stories. Get the Wordsworth edition from Amazon, a great deal! How utterly coincidental - again! I have The Mysterious Mr Badman lined up next week for a review on my blog. It's one of Harvey's legitimate detective novels featuring his only series character - Athelstan Digby. It's also a bibliomystery! I've had a copy of The Arm of Mrs. Egan (the very same Dutton edition with a DJ, BTW) for what seems like decades and I've never read a single story. Time to correct that oversight. John, you must be the OTHER person who owns Badman, lol. I hope you enjoy The Lake. You should love the collection as a whole, with you interest in supernatural fiction.